We stayed in Koh Lanta for 4 nights. Koh Lanta is a much quieter island than Phi Phi. It is a good island to go to, if you want to get away from the crowds of tourist and want a relaxing time away. We were staying on a very quite beach called Pru Klom Beach. This is about 20 minutes drive from the ferry port. This beach wasn’t the best beach for swimming in, as it was very rocky and when the tide was low you had to walk over lots of rocks to get to the sea. If you drive further south, to Klong Nin and Klong Hin beach, you will find it a lot better for swimming in. We hired out a Moped for 200 Baht (£4) a day for a couple of days. We drove to Klong Nin and Klong Hin Beach and we went to Kan Teang Bay, where you can walk through jungle to get to a waterfall. The walk was beautiful, through trees and a running stream. The thing is after arriving at the waterfall, we realised it had no water on it! Still a beautiful walk! You can do Elephant Trekking here also, where you ride the Elephant through the jungle. We also went to Klong Dao Beach in the evening. This is further north and is close to the ferry port. This would be a great beach to stay on, as the beach is great for swimming in, also there are nice restaurants along the beach and it is close to the ferry port, where you will find the main shopping area. On our 2nd day in Koh Lanta we drove to the viewpoint, where you can see the Island from a height. This is a beautiful sight! Then we set off to Lanta Old Town. We came to a corner on the bike, where we had to turn right. We slowly took the corner, but as we did Paul realised there was a 3 foot deep pot hole in the road, so he tried turning away from it, but the bike didn’t turn in time, so he braked, this made us come off our bike. Luckily we were only going about 2 miles an hour, so the damage to the bike and us, was only small. We both got a few grazes that I was able to clean up with the first aid kit I was carrying. Lucky I came prepared! This did shake us both up a little. The roads are quite dangerous, as there are so many pot holes around. If you don’t spot them in time, you have no chance. Whatever you do, wear a helmet. Lucky we were! After cleaning ourselves up, we continued to Lanta Old town. This is only a small town, with a church, a port and a few shops. You can get ferries to other small islands from here. My ankle and knee were sore, from falling off the bike, so we decided to go back. We went back to the hotel and spent the day relaxing in the pool. The next day we went to Saladan Village, right by the ferry port. This is where the main shops are. We looked around the markets there and also the shops in the village. We really enjoyed our time in Koh Lanta, it was very relaxing. Our hotel was very nice. We enjoyed having a pool on the sea front, and enjoyed being able to watch the sunsets every evening. We got our ferry from Koh Phi Phi to Koh Lanta on Friday 2nd April. We really enjoyed our time in Koh Phi Phi and would definitely suggest you pay a visit if you can. You will not be disappointed with the beautiful beaches. It is a little crowded around the island, but there are quieter beaches that you can go to. 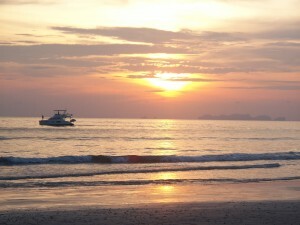 Long beach is a nice beach with beautiful sands and is good for swimming and snorkelling. There are also nice restaurants along the beach. We would stay on that beach if we were to go to Phi Phi again. It is busy, but not as busy as Ton Sai Bay. The crowds are close to the ferry port. Nui Bay and Loh Lana bay are also beautiful beaches. They were two of our favourite spots on the island. These two beaches are very quite, so if you want to get away from tourists for a while, I suggest you hire a kayak and go there, or get a taxi boat to take you there and pick you up later. The ferry over to Koh Lanta took around 1 ½ hours and cost 300 BAHT each. You can purchase your tickets from the many ticket offices on Koh Phi Phi. Just make sure you purchase the day before in the busy season, as the boats do fill up. Many locals came up to us on the ferry, trying to advertise their hotel to us. 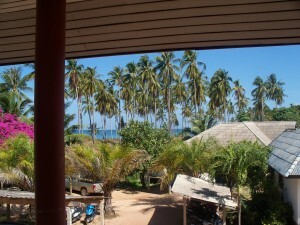 We finally agreed to going to see one of the hotels when we arrived on Koh Lanta. The guy told us that the hotel had internet, which we made quite clear was essential to us, because of work. He promised all rooms had internet. When we got off the ferry we were put into a 4 by 4 car along with 5 other tourists. Two guys from Germany, 2 girls from Germany and 1 guy from Australia. When we got to the Blue Adaman Hotel, me and Paul were separated from the rest of the people, and told to go with the guy who told us about the hotel. I then realised that he must be on commission and that it wasn’t his hotel at all. This would have been fine, if he didn’t lie to us though. We got there and he was quoting the rooms at a much higher price and also we found that there was no internet in the rooms at all, but that it was only by the pool and you had to purchase a card to get on. The man got very angry at us when we told him we didn’t want to pay for a room at this price, when he had told us we would have internet. He angrily told us to leave the hotel. We went to find the official reception. The prices were a lot cheaper and the staff much friendlier. We checked into one of the rooms with a balcony and that was air conditioned, for 550 BAHT a night. The hotel is right by the sea, and the pool looks over the sea. We can also see the beach from our balcony. Even though the guy was very rude to us, we are glad we stayed here, as the hotel is very nice and it is in a lovely quite location, with easy access to other beaches.